Archbishop of Canterbury Justin Welby addresses the Radical Vocation Conference for young people considering ordained ministry in Anglican and Episcopal churches. [Episcopal News Service] The Radical Vocation Conference at Church of the Incarnation in Dallas Sept. 20-22 drew an international crowd of young adults as well as other interested clergy and laity for three days of reflection on the priesthood. The group was given a unique opportunity to hear from top leaders in the Episcopal Church and Anglican Communion about vocations in the ordained ministry. Speakers included Archbishop of Canterbury Justin Welby, Bishop N. T. Wright, Stanley Hauerwas, the Rev. Ephraim Radner and the Rev. Oliver O’Donovan. Presiding Bishop Michael Curry and Archbishop Josiah Idowu-Fearon, secretary-general of the Anglican Consultative Council, were also in attendance. 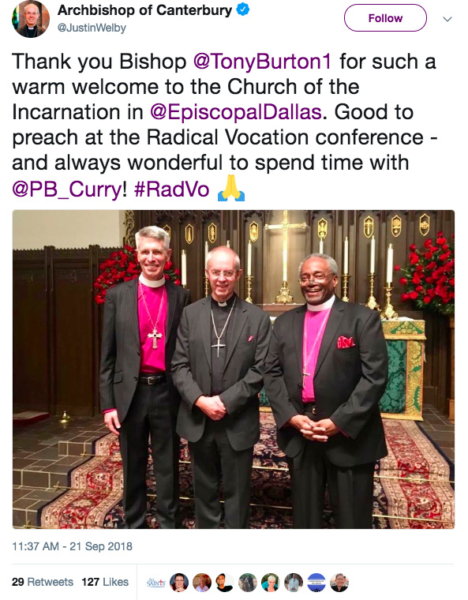 The conference, which was sponsored by the Communion Partner Bishops, the Episcopal Diocese of Dallas and Church of the Incarnation, attracted 400 people. Welby delivered an eloquent sermon creating a mood of prayerful discernment and encouragement when he said that priests are “called to be children of light” to the world. He told the crowd of young discerners that they should be radical, the extremists of love who turn the whole world upside down. Attendees prayed, worshipped, and listened to lectures and panel discussions as they studied how they were being called to serve the kingdom of God. Hauerwas, a professor emeritus of divinity and law at Duke Divinity School, Durham, North Carolina, spoke about the church and pastoral care and how it is not only the work of the ordained. The care that Christians give one another stems from the reality and realization that Jesus is Lord, he said. A breakout speaker, Elisabeth Kincaid, who teaches moral theology and Christian ethics at Aquinas Institute of Theology, spoke about virtuous leadership and the priesthood. The goal, she said, is to become the kind of person who makes appropriate decisions naturally, and to use reason to determine how to live in the community harmoniously. Virtues needed for this, she said, are temperance, modesty, humility, prudence and courage. Church of England priest and ethicist Oliver O’Donovan’s humor and frankness during his session were hugely popular. “His lecture on the importance of good preaching was just excellent,” said Ben Davis, an attendee from Kansas. Prior to the conference, Welby and Curry participated in a question-and-answer session at St. Michael and All Angels Church, an event sponsored by the Anglican Centre in Rome. The two were reunited just a few months after serving in the wedding of Prince Harry and Meghan Markle, and joked like old friends; at one point, Curry quipped that he was Welby’s “sidekick.” The two talked about Curry’s sermon at the royal wedding and how it made worldwide news. “On the way to Windsor Palace the archbishop told me, ‘Don’t hold back,’” Curry said. – Kimberly Durnan is director of communications for the Episcopal Diocese of Dallas.